The Swabian Jura ( Schwäbische Alb (help·info), more rarely: Schwäbischer Jura (help·info)), sometimes also named Swabian Alps in English, is a mountain range in Baden-Württemberg, Germany, extending 220 km (140 mi) from southwest to northeast and 40 to 70 km (25 to 43 mi) in width. It is named after the region of Swabia. The Swabian Jura occupies the region bounded by the Danube in the southeast and the upper Neckar in the northwest. In the southwest it rises to the higher mountains of the Black Forest. The highest mountain of the region is the Lemberg (1,015 m (3,330 ft)). The area's profile resembles a high plateau, which slowly falls away to the southeast. The northwestern edge is a steep escarpment (called the Albtrauf or Albanstieg, rising up 400 m (1,300 ft), covered with forests), while the top is flat or gently rolling. In economic and cultural terms, the Swabian Jura includes regions just around the mountain range. It is a popular recreation area. The geology of the Swabian Jura is mostly limestone, which formed the seabed during the Jurassic period. The sea receded 50 million years ago. Three layers of different limestones are stacked over each other to form the range: Black Jurassic, Brown Jurassic, and White Jurassic. White Jurassic may be as pure as 99% calcium carbonate. Since limestone is soluble in water, rain seeps through cracks everywhere and forms subterranean rivers which flow through a large system of caves until they emerge. Thus there are hardly any rivers, lakes or other forms of surface water on the plateau. In some places, former volcanic activity has left traces, such as maars and hills. In the west, the Zollerngraben (a geological depression in a tectonically active region) sometimes causes mild earthquakes. The Nördlinger Ries is a large meteorite crater (15 million years old). Tertiary relicts can be found at the southern part of Swabian Jura. Famous locations are known in the Ulm area (e.g., Turritellenplatte of Ermingen). Constant rain and other weather influences are slowly dissolving the entire range. Each year, it recedes approximately 2 mm (0.08 in). Some millions of years ago, the mountains reached as far as Stuttgart. In some places, the limestone was more resistant to decay and thus the recession of the main range has left small mountains (called "Zeugenberge"—"witness mountains" or outliers; e.g. the Achalm or the Hohenstaufen) which testify to the former territory of the range. The omnipresent caves are great tourist spots, beautiful and not very crowded. Many different types can be found, from dry dripstone caves to caves that can only be entered by boat. Sometimes the discharge of the water from subterranean rivers can be spectacular, too, e.g. the Blautopf, a source for a tributary of the Danube. Also because of the porous limestone, the Danube nearly disappears near Immendingen (in 1911, 1921, 1928 and 1943 it disappeared completely), only to reappear several kilometers further down. Most of the water lost by the Danube resurfaces in the Aachtopf, a spring for a tributary to the Rhine. The soil is not very fertile, the humus is often as thin as 10 cm (4 in). Many small limestone pebbles are found on the surface. Much of the Swabian Jura consists of gentle to moderate hills often covered with forest or cleared for small-scale agriculture. The traditional landscape was grass fields with juniper bushes. Today this has become a comparatively rare sight. However, in certain places it is protected by the government of Baden-Württemberg. The highest elevations reach just over 1,000 metres (3,300 ft). They are all in the southwestern part of the Jura, in the region of the Großer Heuberg. Schafberg (1,000 metres (3,300 ft)). There are many other peaks in the Alb, such as the Hornau, Ochsenberg, and Achalm. Fossils can be found everywhere in the Swabian Jura. Many large and important fossils were found here. At Holzmaden, outside of Weilheim unter Teck, a small private museum, called Urwelt-Museum Hauff, provides visitors with the opportunity to "dig" for fossils in their shale deposits. The Urwelt-Museum Hauff houses the world's largest petrified crinoid (sea-lily) colony with a size of 18 m × 6 m (59 ft × 20 ft) and an age of about 180 million years. In a number of caves (including Vogelherd, Hohlenstein-Stadel, Geißenklösterle and Hohle Fels), all just a few kilometers apart, some of the oldest signs of human artifacts were found. Best known are: a mammoth, a horse head, a water bird, and two statues of a lion man all of surprising quality and all more than 30,000 years old. The oldest known musical instruments have been found here, too: flutes made from the bones of swans and griffon vultures, some 35,000 years old, and in 2004 a flute carved from the tusk of a mammoth dating from the Ice Age, around 37,000 years ago, and the oldest representation of the human body, the Venus of Schelklingen. This region, located south of the limes, was part of the Roman Empire from around the first to third century A.D.
A Roman road ran along the Neckar river and over the plateau. In Hechingen-Stein a Roman outpost along this road was discovered in the 1970s and has been turned into an outdoor museum. 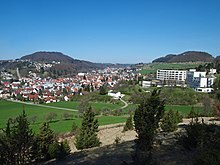 The limes actually cuts across the plateau at Aalen, which gets its name from the original Roman cavalry post, or ala, on the outskirts of the modern town. Here too, the Roman ruins are being excavated and a museum has been open to the public since the late 1980s. Life was extremely hard in the Swabian Jura. The lack of water and the poor quality of the soil made it a backward region. For many villages fetching water required a long journey by horse. Since water often needed to be stored over a long time, it was often stagnant. Thus disinfection via alcohol was very popular: "Most" (apple wine) was mixed with water and even given to babies. A modern water supply system (outstanding for its time) was built in the late 1880s, which eased the situation. Locals in the areas speak the distinct German dialect known as Swabian German, which varies even throughout the Jura and is difficult to understand for speakers of Standard German. The dialect at the top of the plateau (German: Albschwäbisch) is markedly different from, and stronger than, even the broadest Swabian of the lowland areas. Across the whole Swabian region, many phrases and grammar are highly localized, even down to the village level; however, the Swabian dialect of the highland regions is characterised by a sing-song melody, and some of the verb forms are also distinct, not only from Standard German, but also from those of the rest of Swabia. The "Swabian–Alemannic" carnival is an important tradition in many of the villages, called variously "Fastnacht", "Fasnacht", "Fasnet", or "Fasching". Of particular cultural importance is the Fasnet celebration in Rottweil. Typical of the Allemannic tradition are the witches and forest- or well-spirits, who typically signify Winter or the forces of nature coming to drive Winter out. The various roles are often claimed to have been defined in pre-Christian times and here the exact traditions vary from village to village, creating a fantastic variety of heroes, villains and good and evil creatures. It is also often the case that, while in one town a strong tradition of celebrating Fasnet has survived, the neighboring town will have almost no tradition. This is in many instances linked to the after-effects of the Protestant Reformation and the later influence of the Calvinistic Pietists, who more or less strictly opposed such frivolous - even heathen - behaviour. Catholic regions to this day tend to have a stronger Fasnet tradition. A Swabian Fasnet celebration in any case has little or nothing in common with the simultaneous celebrations along the Middle Rhein, which are well known across Germany because they are televised every year. Swabians generally are expected to go to work as normal on Rose Monday and Fat Tuesday, unlike their neighbors to the northwest. Since raising crops was not easy, raising sheep was popular. This yielded the development of a strong textile industry. In the 1950s, Reutlingen was the German town with the highest number of millionaires, until the decline of the German textile industry hit them as well. Still, many high quality textile companies can be found, such as Hugo Boss, Merz b. Schwanen, Trigema, Reusch, Groz-Beckert and others (the town of Metzingen is widely known as a "luxury outlet town", with people from all over Europe coming to buy expensive clothes cheaper). From this, machine building and advanced engineering developed. With the invention of cars and the founding of Daimler-Benz nearby, the car industry and later also electronics and computer industries developed. The "Neckar-Alb" region is the third largest industrial zone in Germany, and the most stable. The best known company is still Daimler-Benz, today known simply as Daimler AG, followed by Robert Bosch. The region has one of the highest patents-to-population ratios in the world. Many products fall into the high-tech category. The small and medium enterprise sector (100-5,000 employees) predominates. Perhaps as a result, the unemployment rate is low. In general, products are expensive but compete through high quality. Several districts are recognised as especially attractive to business, e.g. Reutlingen as the town in Germany where it is simplest to open a new business. Educational resources are at a high level. The schools and universities of the region all enjoy top rankings within Germany. The Swabian Jura and the neighbouring region have developed from one of the poorest regions of Germany to one of its richest within the past 150 years. Moderate. In winter often snow. Skiing is sometimes possible (though the hills are not steep or high). Often windy and a bit colder than the rest of Germany. Because of a special micro climate, a small weather station near the town of Stetten am kalten Markt is known as the "coldest spot in Germany". The Swabian Jura are not densely populated by German standards. Most of the larger towns are outside the region, though they are often counted as part of it. These towns often have some of the highest rents in Germany, while land on the plateau itself is considered cheap (by south German standards). Many town names end in -ingen. There were several military training grounds, some also used by NATO troops. On the Münsingen training ground which existed for over 100 years, a biosphere reserve is in the making. The region has several larger and many small nature reserves. The towns in the foreland of the Swabian Jura officially don't belong to it. There are many castles, monasteries, churches, ruins and old towns. Here is a small selection. A good way for tourists to get to know the Swabian Jura is to travel on the Schwäbische Albstraße, a "National Scenic Byway", leading from Tuttlingen or Trossingen to Nördlingen or Aalen. Brenntar, was a Swabian staple foodstuff, particularly prominent in the Swabian Jura and in the Allgäu. It is made of a specially roasted flour called Musmehl. Alb-Leisa, traditional lentil varieties of this region. The name German: Jura (related to Jurassic) derives from the Jura mountains, of which the Swabian and Franconian plateaux are geographically part. In German, at least outside geological circles, the word Alb is used almost universally in place of Jura. The origin of the word is uncertain. One theory is that it derives form the Latin albus ("white"). Another is that it is from a pre-Indo-European word albhros ("hill"). It is related to the German words Alpe, Alm or Alp (from Old High German alpâ), meaning an "upland pasture". The word Alb functions as a proper noun referring more or less exclusively to the Swabian and the Franconian Jura (German: Fränkische Alb) areas however, and as such has no direct translation into most other languages. It is perhaps for this reason that Schwäbische Alb has sometimes been translated into English as 'Swabian Alps', thus avoiding the lesser-known name Jura. However, the area is not part of the Alps (despite its proximity), nor is it ever referred to as such in German, the Alps being die Alpen in German (plural). ^ Conard, N.J. (2009). "A female figurine from the basal Aurignacian of Hohle Fels Cave in southwestern Germany". Nature. 459 (7244): 248–252. Bibcode:2009Natur.459..248C. doi:10.1038/nature07995. PMID 19444215. ^ Conard, N.J.; M. Malina; S.C. Münzel (2009). "New flutes document the earliest musical tradition in southwestern Germany". Nature. 460 (7256): 737–740. Bibcode:2009Natur.460..737C. doi:10.1038/nature08169. PMID 19553935. ^ "Merz b. Schwanen". www.merz-schwanen.com. Retrieved 2016-12-01. ^ Jacob Grimm, Deutsches Wörterbuch, s.v. "Albe"
Wikimedia Commons has media related to Schwäbische Alb.